We now offer a vacuum table of excellent quality that is easy to use. This is an important addition for any serious studio making paper art. It efficiently and evenly removes the water from any low relief paper work, as large as 4 feet by six feet. It’s even great for making really large, thick sheets, forgoing the need for a hydraulic press. It is ideal for pulp painting where multiple pressings may be needed, and one never has to move the possibly delicate project until the piece has been vacuum pressed. To use, simply pour or couch your wet sheets/artwork. When you are ready to vacuum, cover the table with plastic sheeting to create a seal, turn on the pump and watch the magic! All the water literally gets sucked into the 5-gallon collecting tank. 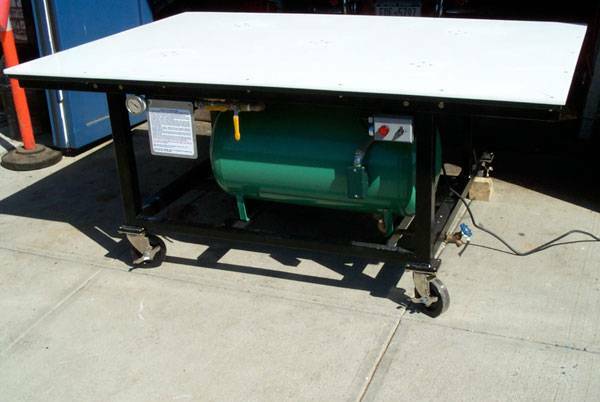 The 4 foot by 6 foot table has a polyethylene surface attached to a heavy duty painted steel frame, and is on wheels. The working height is 28”, and it comes with a powerful 1 hp vacuum pump with a pressure gauge so that you’ll always know when you’re getting maximum pressure. It includes a vacuum diffusing screen for the top surface. A plaque with directions for use are attached to the front of the table. Other sizes may be ordered.